If you’ve dreamed of having a piano in your home but don’t have the space or budget for a full-sized instrument, your wait is over. 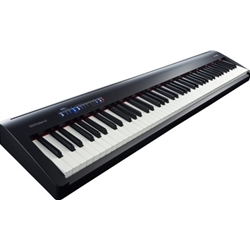 The affordable FP-30 offers Roland’s acclaimed sound, feel, and modern features in a top-quality 88-note instrument that fits most home living spaces with ease. Lightweight and portable, it’s a great fit for performing players and music classrooms as well. Adding in numerous sounds beyond the piano, built-in practice and recording functions, and Bluetooth® wireless support for working with popular music apps, the FP-30 delivers a premium musical experience previously unattainable in such a streamlined package. The FP-30’s exceptional performance, and unrivaled sound and feel deliver an authentic piano experience for maximum expression, providing a solid foundation for proper learning and the detailed articulation and response that experienced players demand. Supporting the FP-30’s advanced SuperNATURAL Piano engine is a powerful onboard sound system, along with a newly developed keyboard that inherits the touch, escapement, and Ivory Feel keys found in our high-end home pianos.